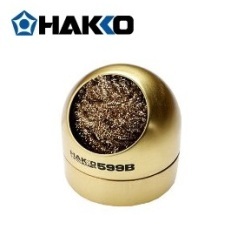 Hakko 599B-02 cleans your soldering iron tips without water! Tip cleaning wire is made from coils of brass, which is softer than the tip plating yet harder than the oxidation that forms on the tip. An ideal alternative to a wet sponge.  To clean the tip, simply plunge (stab) the iron tip into the coils.